It was a great day for birding the high country yesterday—a little bit of fresh snow, a touch of cloud and a light breeze that couldn’t make up its mind which direction it was coming from. I did the ninth annual Apex-Hedley Christmas Bird Count yesterday, teaming up with Kathryn McCourt and Thor Manson to do the Nickel Plate road. We got to the edge of the circle at 0815; a little late for serious birders, but this was designed to be a fun count. I dropped Kathryn and Thor off at the big corner where the road crosses the tiny headwaters of Shatford Creek and drove on for 500 metres or so to start my day. As soon as I got out of the car I heard some tapping in the forest, so began my standard schtick for attracting birds in these woods—I whistled like a pygmy owl. Immediately a couple of Common Redpolls flew out of the treetops, followed by a White-winged Crossbill. 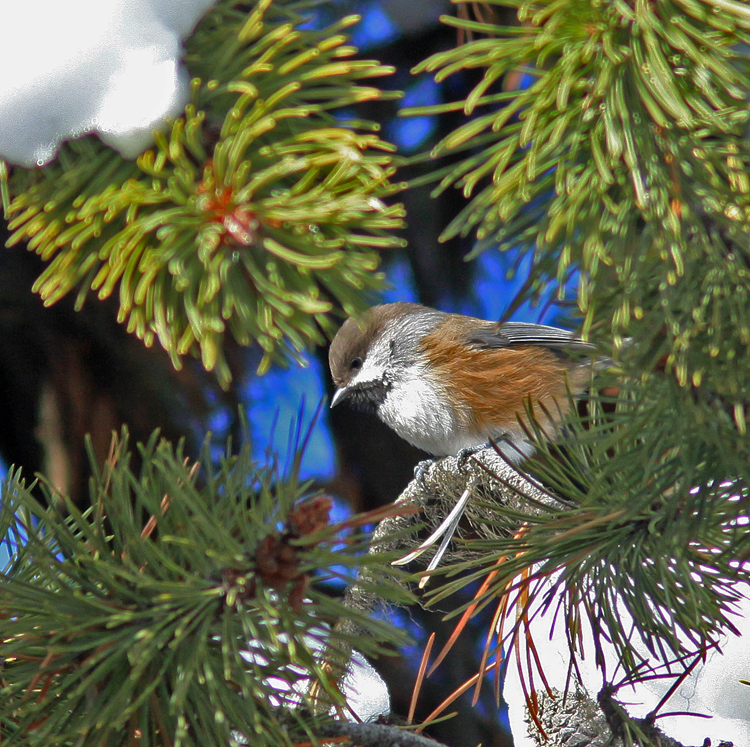 And then a trio of Mountain Chickadees called, joined by a couple of Red-breasted Nuthatches and a Boreal Chickadee. The Boreal was a surprise at these mid-elevations—they’re usually much higher up the mountain. Then the calm toots of a Northern Pygmy-Owl; and I quickly found him on top of a Douglas-fir. Finally, a Hairy Woodpecker scolded me and flew off towards the far hillside. A good start for a count that can be annoyingly quiet for much of the day! We saw several more flocks of redpolls and White-winged Crossbills, both taking advantage of a bumper spruce cone crop, excitedly working the cones in tight flocks. I wasn’t surprised to see the crossbills doing this, but I usually see redpolls feeding on birch or alder seeds. 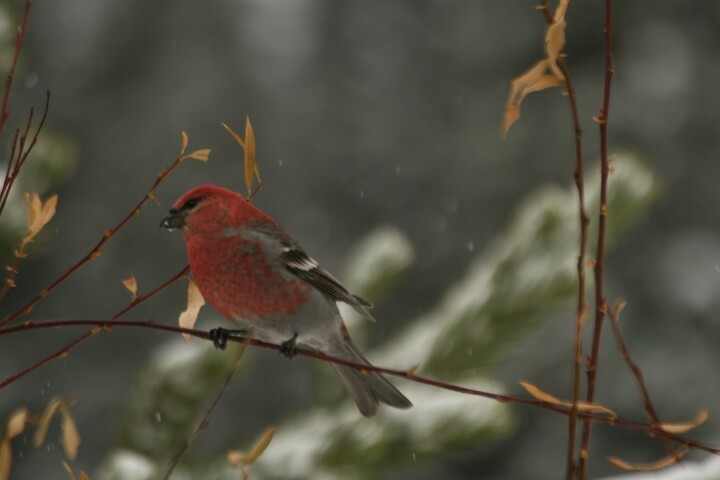 It was nice to see both species—we only get good numbers of redpolls every two or three years, and it can be a decade between good years of White-winged Crossbills in southern British Columbia. After 5 kilometres of hopscotching up the road we reached the Apex ski village and spent some time searching for active feeders amidst the hubbub of snowplow activity. Steller’s Jays and Clark’s Nutcrackers were the most conspicuous birds, but finally I heard the mellow warbles of Pine Grosbeaks. There they were—three gorgeous birds right next to the car, nibbling willow buds. Farther up the road there were a half-dozen more, then a flock of 20 right on the road! We valley-dwellers don’t see this species that often, so that was a real treat. Beyond the ski village the road passes through some high subalpine forests of Engelmann spruce and lodgepole pine. Thor had seen some Boreal Chickadees here last week, so we stopped a couple of times (dodging a few very large logging trucks—amazing how early in the day those guys start!) and eventually found a small flock. Red Crossbills flew overhead at each stop. As the road began to descend to the Mascot Mine I dropped Thor and Kathryn off again and we began our walk-drive-walk-drive down the big hill. My first task was to get a Christmas tree—there are a lot of nice subalpine firs growing under a powerline here and I never miss the chance to get one on this count. The White-winged Crossbill flocks appeared again as we descended, and Kathryn finally got the good long look at Common Redpolls she’d been asking for. A small car coming up the hill stopped and a young skier asked if this was the way to Apex; “It’s not the usual way” I said, “but certainly the most adventurous!” He mentioned that he’d been stuck for an hour lower down, then spun in place until I gave him a push to get some momentum on the steep slope. An immature Golden Eagle sailed low overhead, adding raptorial spice to the subalpine songbirds. As we reached the steep switchbacks below I realized what had caused the young skier problems—the road was sheer ice under a few inches of snow. We carefully slid around the tight corners, passing the deep ruts that marked where the small car had gone off the road. This was prime Townsend’s Solitaire country; the slim thrushes set up winter territories on these open slopes with an abundant supply of juniper berries. I found a spot to pull over on a section of the road that has a two-thousand-foot drop to the valley floor; Thor immediately pointed out a solitaire atop a snag, so we hopped back in and continued down the big hill. At another corner the road crosses a brush-filled creek gulley. We once had a dipper here (a most unlikely place!) but our real target was Pacific Wren. These tiny birds descend from subalpine forests to winter in thickets in the valley, but can be very skulky and hard to see in winter. 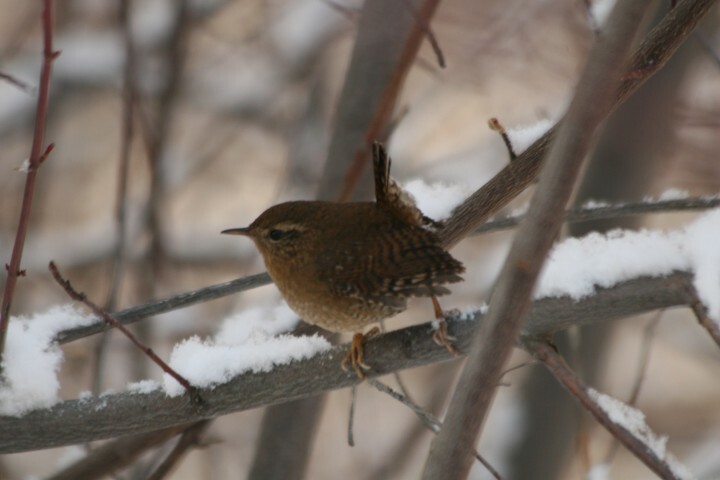 I pished a few times and a wren quickly popped up and began to call. On a whim, Thor played the wren’s song on his iPod and the bird shot towards us, singing full tilt and swaying from side to side with its wings open. Another bird, presumably its mate, appeared as well and silently observed the show from a few feet away. We quickly stopped the playback, not wanting to disturb the bird further, but it was a surprising display of winter territoriality. After uncountable switchbacks we finally reached the main highway along the Similkameen River. 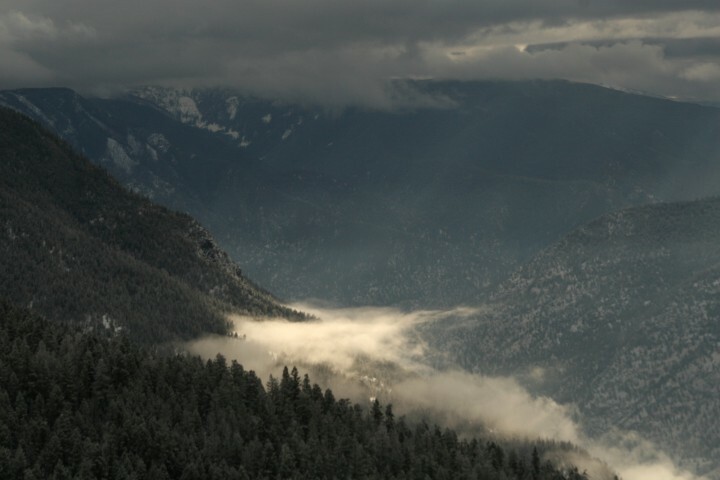 We had two and a half hours to cover a section of the valley here, madly scrambling to pick up common low elevation species such as juncos, quail, and Pygmy Nuthatch. Another focus of this section was obviously the river itself. Dippers are regular here but numbers fluctuate from year to year, presumably because of differences in ice cover upstream as well as population levels. At our first stop we counted 9 dippers—a very heartening total—and by the time darkness set in we had 24, I think an all-time high for that part of the circle. And although we found a few Song Sparrows, juncos and House Finches, we couldn’t find a single nuthatch, starling or quail to add to the list. 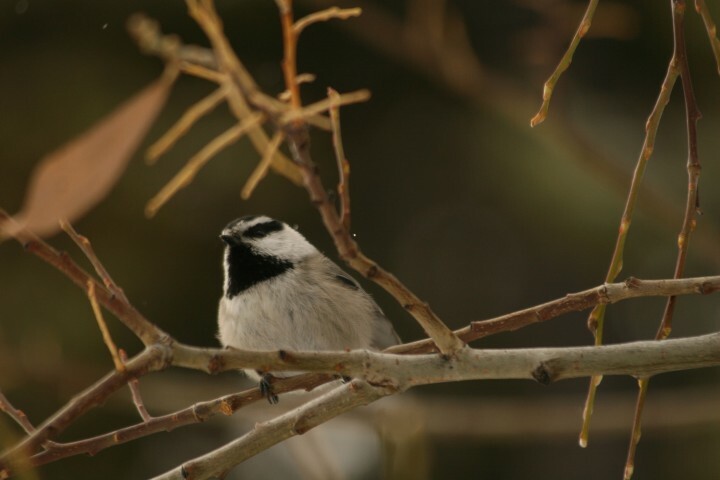 Despite my quest to get the chickadee “grand slam”, we failed to even make a chickadee hat trick, since we’d not only missed the rare Chestnut-backed, but also dipped on—shudder—Black-capped as well. As we turned for home we finally saw a flock of 30 California Quail in a Keremeos orchard right on the edge of the count circle. Phew! A Eurasian Collared-Dove nearby was definitely outside, so we closed our notebooks and headed for the Tim Horton’s in Penticton to meet the other count participants. We were the last to arrive, so listened to various tales of winter hiking and skiing while we tallied our list. My son had seen a Black-backed Woodpecker—a great find in an area without a burn or big beetle infestation. The Nickel Plate Lake gang had come back without finding their grail bird—the White-tailed Ptarmigan—but it sounded like everyone had enjoyed the pleasant weather of the day. Our group’s total was 37 species and the overall count was 53 species. About average as far as the statistics go, but one of the most enjoyable Apex-Hedley counts yet! ← The Christmas Bird Count season begins! Thank you and hope to follow and maybe join in on some of your projects.